Deer Fencing is the preferred choice of homeowners who have deer and other animal intrusions and destruction on their property. Deer Fencing offers a virtually invisible means of protection at an affordable cost. Our Deer fencing is a low maintenance, all black system constructed with steel powder coated posts and the fabric is made of a heavy duty poly material with a 900 lb breaking load. Deer fencing is aesthetically pleasing and is also easy to repair from damage by trees, equipment, etc… We at Capital Fence prefer to use the very heavy duty carbon black poly fabric with the added UV protection for most of our applications. 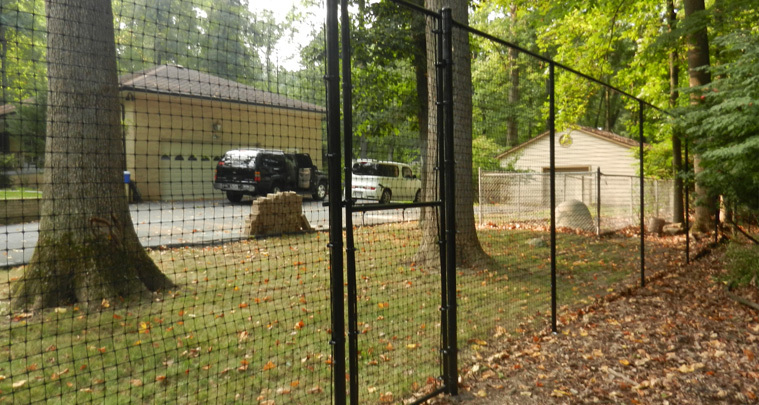 Deer fencing is the only approved 8 feet high fencing in residential neighborhoods by Montgomery County, MD.